A friend sent me a link to someone that has not been written about lately and that link (seen below about Pulitzer Prize) took me on a 4 hour hunt. What you will read, hopefully, will open your eyes to some very important details. The first one is, just because someone get attention, it does not mean they deserve it. It just means they know how to get as much as possible for themselves. The "brains" behind the lost battle for minds caused this landmine for our service members and first responders. There is another way to put it but I'd end up with an "adults only" rating if I used what I am thinking. Valvincent Reyes and Dave Grossman are among the "brains" responsible for telling the most courageous among us that they must be weak minded if they end up with PTSD or think of suicide. 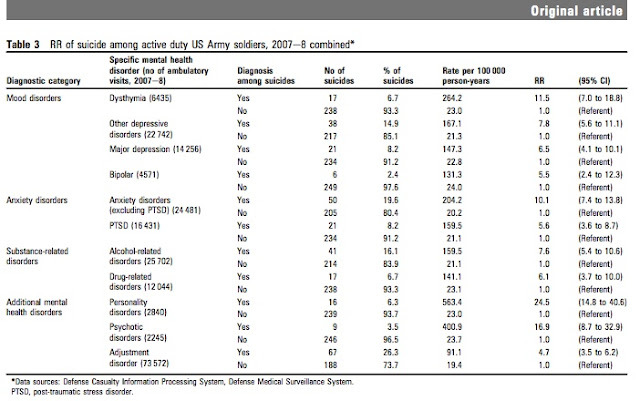 Demographic characteristics and their associations with suicide A total of 255 active duty soldiers committed suicide in 2007 and 2008 (115 in 2007 and 140 in 2008). Table 2 presents the distribution of demographic characteristics for this group of individuals. Suicides were predominantly male (95%), 18e24 years old (45%) and Caucasian (73%), married at the time of death (59%) and lower enlisted (54%). Almost 69% had been deployed at least once to combat theatre. "Battlemind training before they deploy." "As soon as they are approved medically and psychologically, they are sent to war." Published on Sep 9, 2010 Lt. Colonel Valvincent Reyes, Clinical Assistant Professor at the USC School of Social Work, delivers a lecture at the San Diego Academic Center on November 24th, 2009 about Battlemind, the army's current model for mental health care, with an emphasis on its application before deployment. Lt. Col Reyes illustrates the discussion with his recent experiences debriefing victims and family members of victims in the aftermath of the shooting at Fort Hood. But this training does not work. The rise in the number of suicides within the military and veterans community prove that one. While the number of reported veteran suicides is in dispute, the percentages are not. 65% of the veteran suicides are over the age of 50. That is a reflection of the Veteran demographics with the majority of US veterans are in fact, over the age of 50. What is even more troubling is that those older veterans did not receive "preventative" training before deployment, nor did they receive any of the "efforts" people like Grossman were pushing. Every service member has been "trained" yet the results in the OEF and OIF veterans as well as those currently in the military have proven beyond a shadow of doubt, this is not only not working, it has had the opposite result. The rate of OEF and OIF veterans are triple their peer rate. For female veterans, suicides are six times higher than other females. Training, like Battlemind, followed by the stupidity of Comprehensive Solider Fitness, actually prevents them from seeking help as soon as they acknowledge they need it. How? Because they were all told they were training their brain to be tough enough to take whatever they face. In other words, if they need help, they were weak minded or did not train right. Thus, prevented from opening up to the others they served with so that no one would see them as weak. In 2009, I had a prediction of this disastrous outcome. Then again, Grossman does not seem to even get the functioning of the human body. While no human can take a bathroom break during combat, but the body does what it has to even though it is not convenient, Grossman took the opportunity to disparage even that aspect of combat. Warrior Mindset: Mental Toughness, Skills for a Nation's Peacekeepers. "If we look only at the individuals at the tip of the spear and factor out those who didn't experience intense combat, we can estimate that approximately 50 percent of those who did experience it admitted they had wet their pants and nearly 25 percent admitted they had mess themselves." Ok, sure he must expect them to be able to say "hold your fire I need to take a leak" and then walk away from the action. So why point out something like than unless you figure it matches what you already assume they are? Back to the facts, these are the numbers after they pushed this training. As you look at the numbers remember the size of the military had gone down year after year. 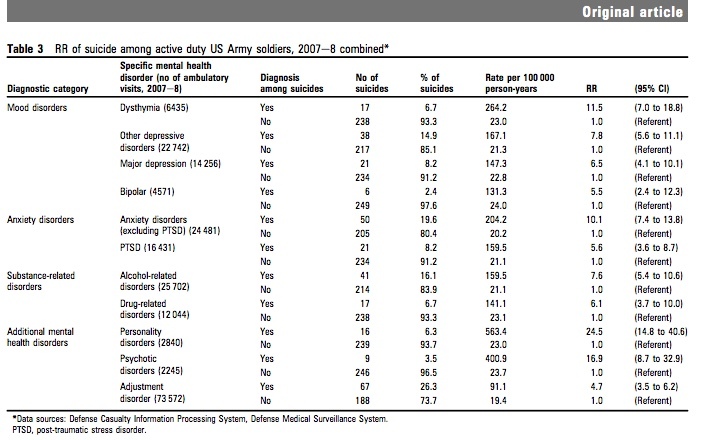 Less enlisted equals higher suicide rates. As you have just seen, the "training" did not work and when the DOD points out that the "majority have never deployed" proves it even more. Think about this training not preventing the "non deployed" from killing themselves, then wonder how they expected it to work on those with multiple deployments. Any reasonable "expert" would have understood this calamity and ended it, but they turned around and planned on just pushing it harder. I’ll leave it to the reader to determine the whys of someone that sells books and training for a living to likely fudge the difference between paying $50 and filling out a form to being an actual Pulitzer Prize nominee. My opinion is if, like John Giduck, Mr. Grossman is knowing lying about his background to sell you books and seminars, what else is he lying about? See the links below to learn more about the circle around that mutually promote and defend each other. I still laugh about how cops pay a guy that never killed anyone for advice about killing. How dumb is that? You may as well be sitting in a Grossman lecture about menstrual cramps. That article is from 2014 but his claim goes back even further. Pulitzer-Nominated Author to Keynote TREXPO West 2007 January 29, 2007 CS StaffLOS ANGELES – Campus Safety Magazine and the organizers of TREXPO announce that Lt. Col. Dave Grossman, one of law enforcement’s most in-demand speakers and trainers, will be one of the charismatic keynote speakers at TREXPO West 2007, March 19-22, in Long Beach, Calif.Grossman has been featured on TV and radio talk shows, in documentaries and in newspaper stories across the United States, Australia and Canada. Wherever Col. Grossman speaks, he draws enormous crowds and standing ovations. The way he energizes and captivates his audience is legendary!Grossman will deliver the opening keynote address on Tuesday, March 20, discussing a sensitive topic he has studied extensively: violent behavior and the ways law enforcement and communities can prevent fatalities. He is the founder of Killology Research Group, a police and military consultancy, and the author of the Pulitzer Prize nominated On Combat and On Killing, which is required reading at the FBI Academy and some of the nation’s top military schools.This talented speaker and trainer combined his experiences as a West Point psychology professor, a professor of military science and an Army Ranger to become the founder of a new field of scientific endeavor, which has been termed “killology.” In this new field the impressive Grossman has made revolutionary new contributions to our understanding of war and violence in our society. And yet these "brains" do not seem to be able to explain how the bravest of the brave have not only proven their courage in combat, they have received the Medal of Honor. Many of them talk about their own battles with PTSD as well as how heroes like Dakota Meyer have attempted suicide. "But triumphant times led to terrible times, with Meyer attempting to kill himself: "So, I pulled over to the side of the road and I just pulled one of my guns out and I just put it to my head and squeezed the trigger. And...there wasn't a round in it. I don't know. I have no idea, but, obviously somebody had taken it out...and it sobered me up. And it was like, at that point in time, I told myself, I have to figure this out. I have to figure this out because if I would have killed myself, that was the most, you know, selfish thing that I could ever do."" Maybe folks should stop listening to the "brains" that have contributed to the stigma of PTSD and start listening to the folks actually trying to do something to change the outcome?